Satyagrah movie is most awaited movie directed by Prakash Jha . Prakash Jha is the best director of the bollywood. This Is the latest movie directed by Prakash Jha . Prakash Jha favouter actor Ajay Devgn is working as actor in this movie. Many Actor and actress working in movie Amitabh Bachchan , Ajay Devgn ,Arjun Rampal ,Manoj Bajpai ,Kareena Kapoor and Amrita Rao .Produced by Prakash Jha ,Ronnie Screwvala and Siddharth Roy Kapurwritten by Anjum Rajabali , Prakash Jha and Rutvik Oza . Music is given by Salim-Sulaiman ,Indian Ocean ,Meet Bros Anjjan ,Aadesh Shrivastava And Lyrics By Prasoon Joshi . Amitabh Bachchan is playing a Retired teacher Dwarka Anand. He is an ideal person.Ajay Degn is playing a engineer role and he is son of Dwaka Anand and name is Manav Raghvendra. Dwarka Anand always believe in truth and lives in society works for society.And he wants to come back his son in society.Kareena Kapoor is playing Yasmin Ahmed .She is a hard headed TV reporter and loves deeply with Ajay Devgn in movie.Arjun Rampal play a role Arjun .He wanted to become politician and stron committed to to become a politician .Manoj Bajpai plays a role Balram Singh.He is a young politician and always wanted to break the rule and system. Amrita Rao plays role of Sumitra as daughter-in-law of Amitabh. All shooting of this movie shooted in Delhi and Bhopal. 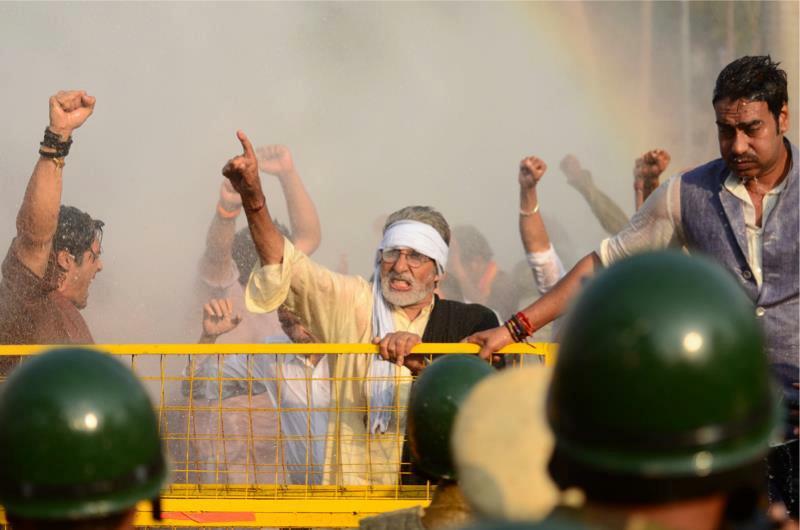 Satyagraha is also shot in IES College campus,Bhop.Prakash Jha also had a small presence in the film. Today movie is released. The expected earning of this movie is about 25 crores . Because Previous movie chanaii Express first day collection about 32 crores. Satyagraha is release in more than 1500 screens in India Huge Amount tickets is alredy booked.This movie also wiil stand on hit list movie of year 2013. Expected earning of first day collection will 20-25 crores suppose.